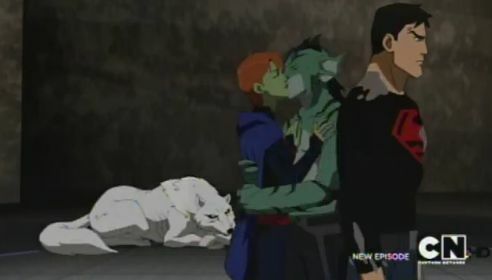 Miss Martian and Lagoon Boy kiss!. . Wallpaper and background images in the 《少年正义联盟》 club. This 《少年正义联盟》 photo might contain 街道, 城市风貌, 城市环境, 城市场景, 城市设置, surcoat, and 外套.